"The Columbia's lost. There are no survivors." 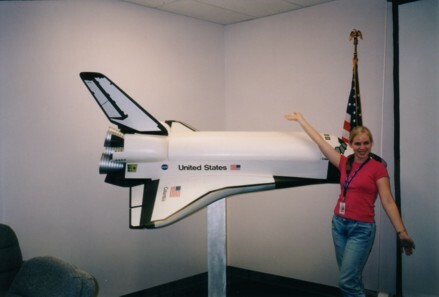 On August 12, 2000, during my first summer internship in California, I visited the Boeing facility in Palmdale. It was a Saturday and the Palmdale desert climate was very different than what we were used to living in Seal Beach, three blocks from the ocean. It was oppressively hot, but we ignored our discomfort because we had the opportunity to see the resident shuttle, Columbia. It was in Palmdale having a glass cockpit installed as part of an overhaul. NASA had decided that the analog readouts finally needed to be replaced with digital ones. On this visit, I took a few pictures of the somewhat disassembled shuttle and its hearty reception by the Boeing employees. Now, after the tragedy of February 1, 2003, looking at these pictures is difficult. 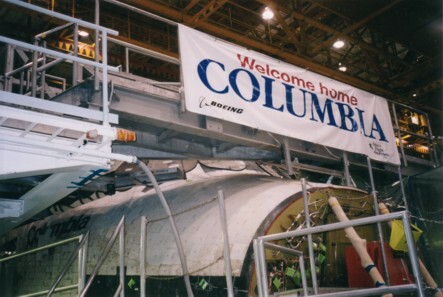 Seeing the words �Welcome Home Columbia� on the banner remind me of President Bush�s speech two weeks ago. "I am at work on this Saturday morning. At 9:30 AM I am leaving for a tour of the Boeing Palmdale facility where one of the orbiters is housed for the time being. I only have two more days of work before I drive back to Florida. Let's hope they turn out well." 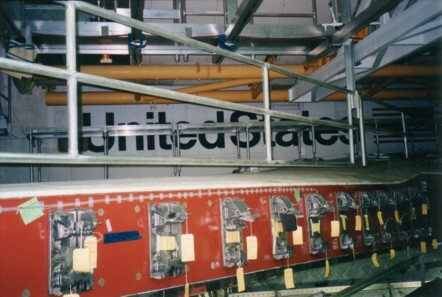 "Also yesterday I went on a tour of the Boeing Palmdale facility. 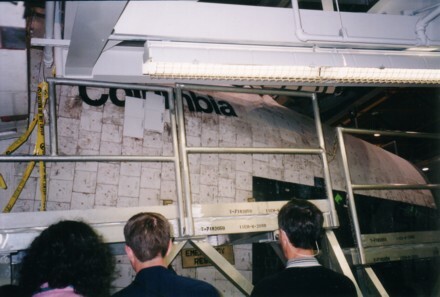 The space shuttle orbiter Columbia is housed there for the time being while undergoing an overhaul. All of the orbiters are scheduled to fly dozens of missions over the next few years to complete the construction of the International Space Station (ISS). Anyway, we did indeed get to see the orbiter."